Igor at Allfishingbuy asked me some time ago what I would like in a tenkara rod suited to saltwater applications and larger fish up to the 10lb range and even beyond. I told him what I thought, and he has now come out with his own line of rods suitable for inshore saltwater applications. As it turns out, these rods are suitable for big fish and big water freshwater applications as well. Igor asked me if I would pick out one of these rods from his lineup and do an honest review. He said he would send me a loaner rod of my choice. He said if after the review, I did not want the rod, I could just send it back, but if I decided I wanted the rod, he would offer it to me at a discount for my efforts. I have decided that I definitely want the rod and will not be sending it back no matter what the cost which as of this writing has not been determined. 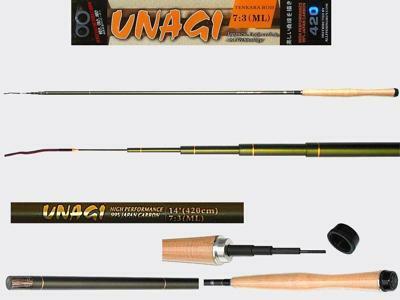 I chose to test the Unagi-4205 because I decided based upon the pictures and descriptions on the web site that this particular rod would be a good all around choice for inshore saltwater fish to about 10lbs. I was thinking about puppydrum, stripers (rockfish), flounder, bluefish, and speckled trout, all available in the waters I fish around the Chesapeake bay. I have yet to have the opportunity to use the rod to catch saltwater fish but I have done some extensive successful carp fishing. Although I often fish for carp with flies, I decided to use whole kernel canned corn in order to hook and land enough fish to really get a feel for the rod under strain. In the last few weeks I have landed nearly 40 carp to over ten pounds. This rod has surprised me...pleasantly so. I wasn't sure that a tenkara style rod could bridge the gap between traditional tenkara and pole fishing. The extra strength of the Hera telescoping poles combined with the lighter weights of tenkara rods and the welcome addition of a good cork handle have made for a good transition rod between traditional tenkara rods and modern telescoping poles. This is a rod that can handle the lightest flies, big bass bugs, saltwater Clouser minnows, and, yes, bait. Just when I thought I would be limited to an 8 wt or heavier traditional fly rod or spinning rod for most of my inshore saltwater fishing and carp and other "big" fish fishing, this rod comes to the market place. The problem for me for big fish pole fishing has been the length and weight of the poles needed to land big fish. The reason I never got into spey rods was not that they weren't effective but that they were just too cumbersome. Even switch rods were heavy when the appropriate line and reel were added. One of the most appealing aspects of tenkara has been the simplicity/pleasure of fixed line fishing with a rod that could be handled with one hand. For me the total weight of a one handed rod needs to be under 4oz. The Unagi-4205 easily meets that requirement and is a pleasure to use all day. I have tried a number of lines with this rod and many work well. My favorite has been the 15lb fluorescent yellow running line offered by Igor. Yours may be a custom furled or hand twisted line, a section of old fly line, or a custom hand tied line, or a level section of fluorocarbon. I have used both the braided loop connectors and whip-finished my own loops. Both work. My everyday line length has been about 16 feet with about 3 or 4 feet of a loop to loop hand twisted line as a transition (a heavy section of mono would also work) to which I loop to loop about 4 to 6 feet of 8 or 10lb tippet. Yes, this rod will handle heavier tippets than your typical tenkara rod. 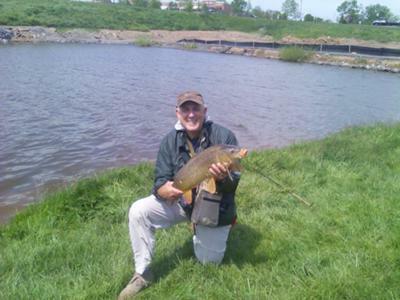 I actually had a few larger carp break my 8lb tippet without breaking my rod. There is technique in keeping the fish in check on the initial run and keeping the fish constantly off balance until tired, but that is equally true of light tippet fishing with a traditional tenkara rod. There is no teacher like the loss of a great fish due to improper technique. I use two hook keepers on which I figure eight my line when not fishing. I also have two additional o-rings rolled onto my rod between the hook keepers. These are for tucking in the end of the tippet or even one or two hooks or flies. Cosmetically the rod is simple but elegant. The cork rings are good with very little fill and the handle is ergonomically designed to fit one or two hands in different positions as needed. It is 11" long. The rod finish is non glaring deep olive satin with gold accent striping at the ends. Mine measured 13' 9" extended, 43" closed. I did not weigh the rod on a scale but feel certain it is under 4oz. I really like it. At $123.22 I think this rod is a real bargain. I also think this is the rod most tenkara fishers have wanted for big water, big fish situations. I have often thought it unreasonable to have a rod limited to 5X or 5lb tippets and expect to land big freshwater fish without undo stress, pull a largemouth bass out of cover, or land any powerful saltwater fish no matter what the size. This rod is light enough for one hand use and small flies, but definitely has the backbone and tip strength for the big boys. Again, I may receive this rod at a discount in exchange for this review, but I feel I have accurately stated my true feelings and would be willing to pay full price for this rod. Thanks for the review. I know a number of tenkara anglers in the US have been looking for a rod that would handle larger fish than the traditional tenkara rod (with 5x tippet) was designed for. I've been curious about these rods, but I haven't needed a "big fish" rod for the kind of fishing I do. Without getting into just exactly where the line between tenkara and pole fishing is drawn, it does seem from your review that people who have wanted a rod designed specifically for stronger tippets and bigger fish now have one. Come to think of it, we do have stripers up here. And blues. And steelhead. And of course carp. Hmmmmm. Oh, and I pretty much feel that the question should not be "is it tenkara" but rather "is it fun?" Doggone it, Randy. You beat me to the punch! I got the Unagi 4505 and was hoping to get it out this weekend for lake flats fishing. Will see and will report back. All I can comment on now is that I think it is an incredibly pretty rod with it's flat olive ( a car manufacturer would probably call it "Spruce") rod and gold and copper accents. You've described the quality of the grip well, and those familiar with other allfishingbuy tenkara rods will recognize the shape. I hope to address the shape a little more when I fish it. Also, the packaging is a step up from what I've experienced in the past. I know, that has nothing to do with the fishability, but it is clear that Igor is proud of this line and it shows. Glad to read you've enjoyed it and see how you approached the line issue. I am waiting on some furled lines to match mine for comparison. For what it's worth, I got the rod for two reasons - I wanted something that would let me fish the kinds of waters my few conventional fly angler buddies wanted to fish involving wider waters and wind, and I thought a longer rod would allow me to explore large ponds and lake flats better. We'll see. You neglected to comment on the name, which is, of course, an incredibly important part of the angling experience. I have no idea what eels have to do with angling with a fly, but I can say that the name Unagi, does make me hungry and every angler should be hungry. It's traditional. It also calls to my mind memories of people harvesting lamprey here in the Pacific NW and that also makes me hungry. Again, I have no idea what angling with a fly and lamprey have in common, but an angler should be hungry, darn it. My latest conquest with this rod (Unagi 4205)is a 31in 17lb+ carp caught at the mouth of the Jackson River 15min from my house in Warm Springs, VA. I was in waist deep water and had to follow the fish up and down stream a few times before finally tiring her enough to land her. I filleted her out, salted and soaked the fillets in milk for a day. I took one of the steaks and covered it with House Autry fish flour with a little Old Bay seasoning and fried it in olive oil. This was my first carp to eat and definitely will not be my last. It is delicious. That's a GREAT fish, Randy. These rods clearly have alot of backbone in them. What do think about a light hera rod instead of a strong tenkara rod for bigger fish? I think the Hera rods are great. I had a 21 footer that would be perfect but I accidentally drove over it. I still have a fifteen footer and 12 footer but haven't tried them yet. I haven't been fishing because my brother has been in the hospital since April 1st with cancer and I am with him most of the time. The key is a combination of the size of the fish and flexibility of moving with the fish until it tires. If the fish has a large area to run and you can't follow it along a bank or by wading in shallow water than your tippet or rod will give out if the fish is heavy enough and likes to run. 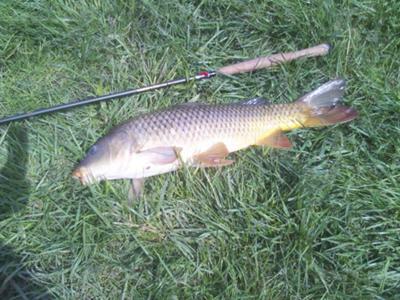 Carp are strong fish and a fixed rod and short line can be limiting. It just depends if he or she likes to take a long run or not. Like all fish, their fight or flight habits may dictate the ultimate outcome. Some fish make short runs and do more head shaking and these are more easily landed than those who just take off in a straught line for deep water. A big strong fish making a quick decision to run to deep water is hard to turn . If you can move with them or turn them toward you during that initial run then you will probably win. A really big fish may need a very strong long rod and heavy tippet and strong hook. I have lost some big fish. In a small pond or shallow flats area whereI can move, I usually win, even with lighter tackle.There is nothing as thrilling as landing a big fish on a long pole/rod and fixed line. Good luck.